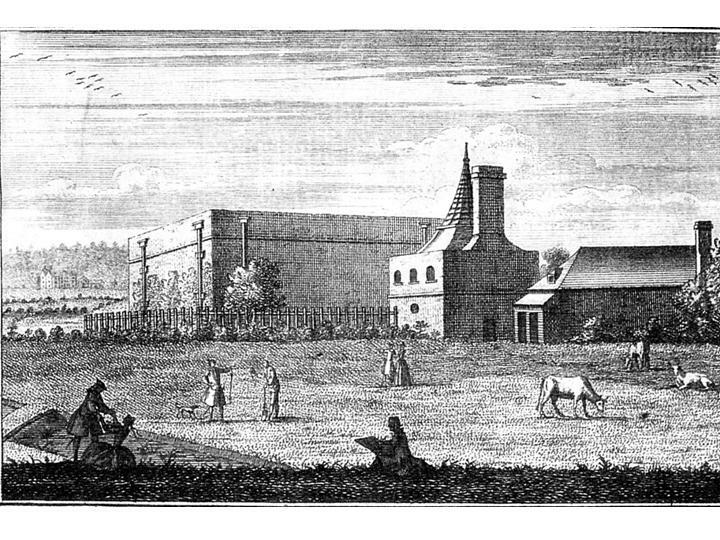 Wayne Cocroft has provided us with information about the Greenwich magazine, including a print (Greenwich Local History Library, Martin Collection 1182) which is thought to date from the 1730s. The history of the building of this magazine has been summarised by O.F.G.Hogg in The Royal Arsenal, vol 1, OUP, 1963 pp 106-7. In October 1694 the Ordnance Office wrote to the Treasury explaining that the Queen had been pleased because gunpowder had been removed from Greenwich house to stores at Gravesend and Tilbury which were now full so that a new powder house was needed. They estimated that it would cost £b,218 13s 9d to build a magazine, a wharf, a proof house and a dwelling house for the storekeeper. A map which accompanied a survey of the Manor of East Greenwich in 1695 shows that a “New Magazine” had already been built at the side of the Thames at NGR TQ 391788. This is the large building in the print and presumably the smaller buildings are the proof house and the dwelling house. Note also the mandatory cows (see GMSG Newsletter 18, p 16) and the nonchalant humans. In practice the presence of the magazine caused great public concern and eventually in the 1760s the gunpowder was removed to new magazines at Purfleet. Wayne suggests that the parapet on the magazine building in the print may indicate that it had a low vaulted roof covered with sand and shingle. He also notes other interesting buildings on the map including a “House for Fireworks (NGR TQ 392768), a “Mount for trying of Mortars” (NGR TQ 389 7b5) and a “Laboratory” (NGR TQ 387777), which according to Hogg was used for manufacturing fireworks, including match, but had been closed by 1694.